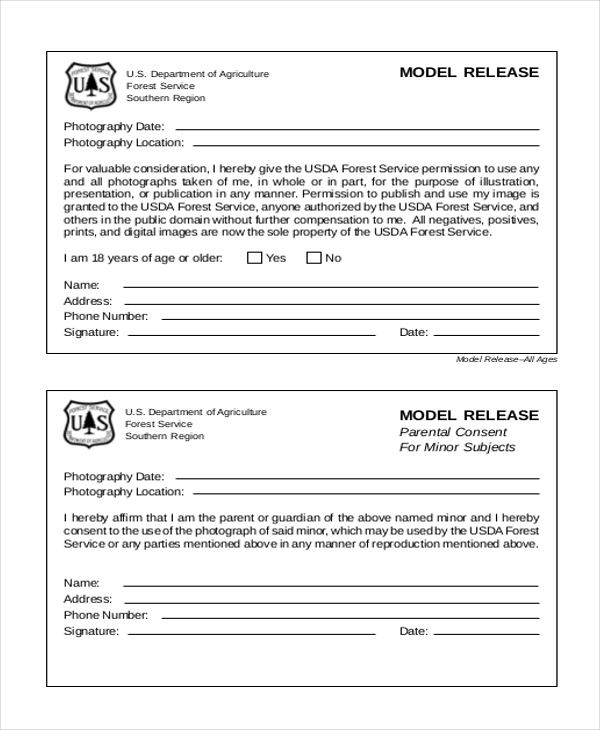 A model release form is the one which a photographer has to obtain from a model when he is looking to publish the model’s photo for commercial use. Such as for promotional or marketing campaigns. 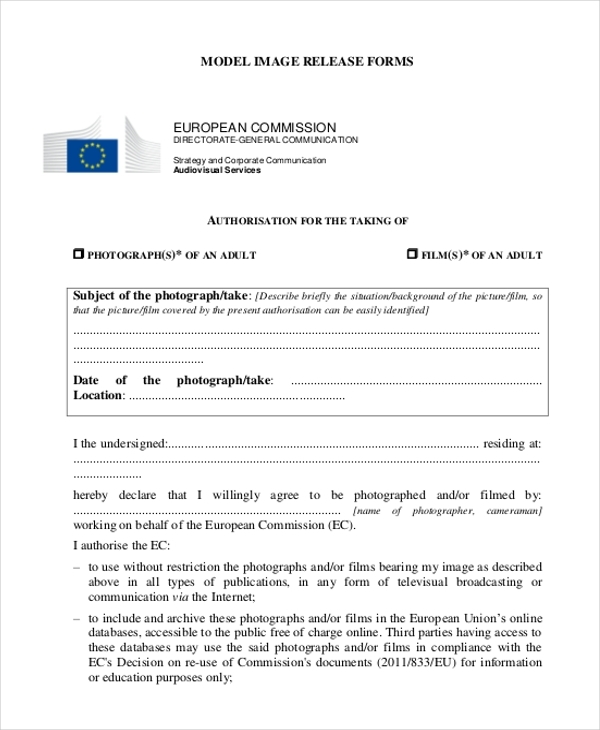 If you are clicking the photo with the prior intention of using it commercially, it’s better you inform the model and get the Release Forms signed by him or her before the shoot only. There are readymade model release forms online to make everything convenient for you. You have 3 model release form samples here that allow you to take model release consents from both adult and minor photography subjects. Added to photos, the form also applies for consents for video, audio recordings, and artworks. You have a simple and professional model release form here that starts with the photographer’s information and goes down to the fact that the owner of the photograph has willingly permitted the consent to publish the photograph. 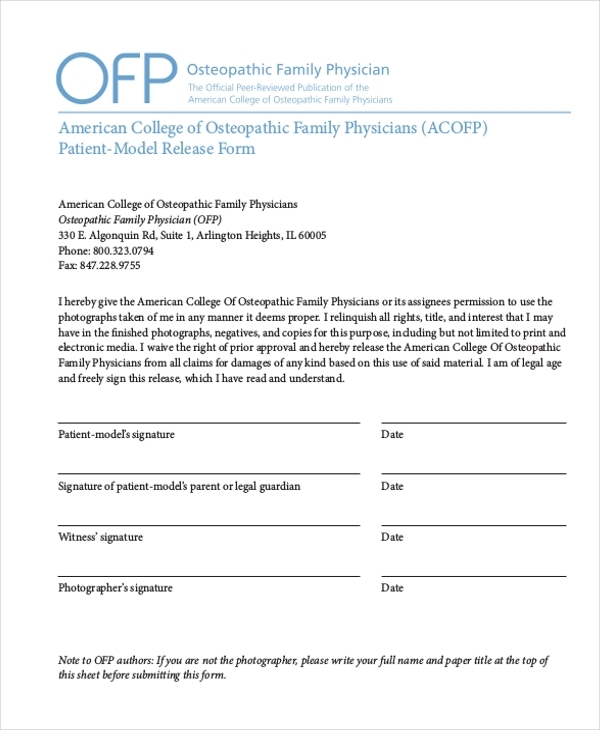 If your clinic needs to publish the photograph of a patient model, this form here is just the thing you need with its readymade declaration. You would just need to download it and get it signed by your patient. 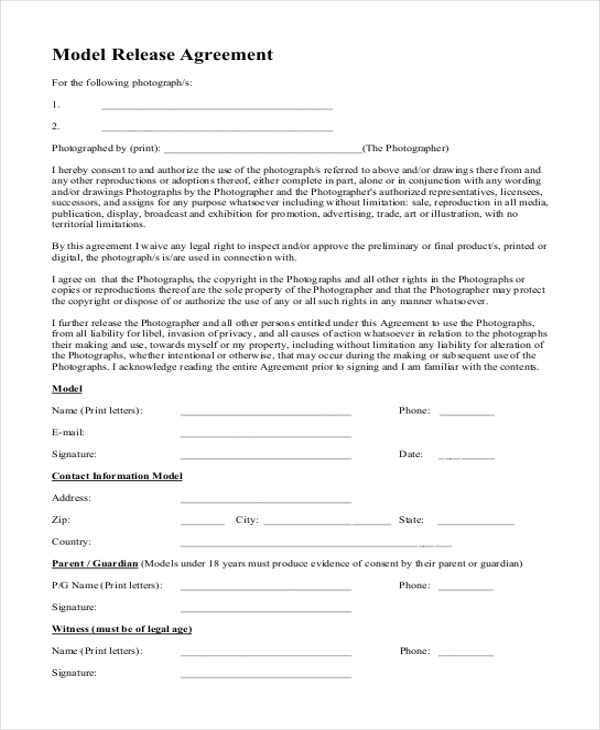 You have a detailed model release form here which states step by step what rights the model has granted to the organization in regards to the publish of his or her photograph. 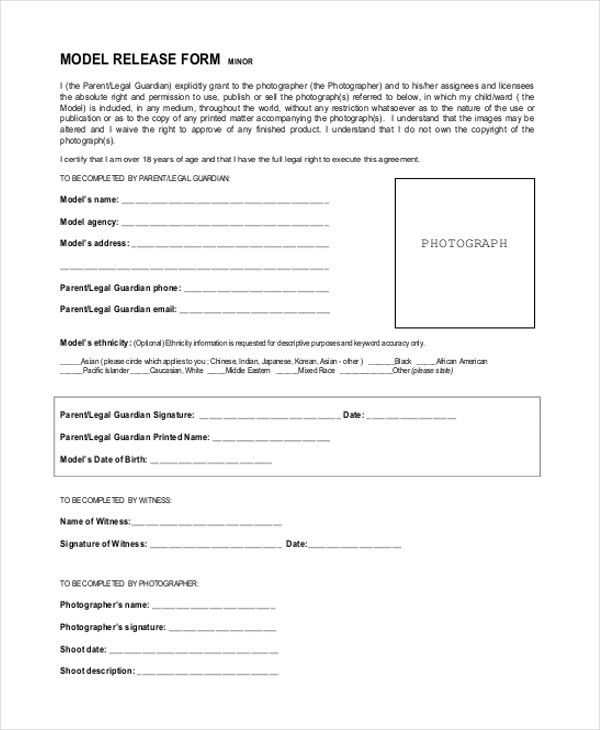 You have 2 model release forms here, including one for a minor model where the parent is offering the needed consent for publishing the image. The form recognizes that now the organization looking to publish the image has every right over the photo. 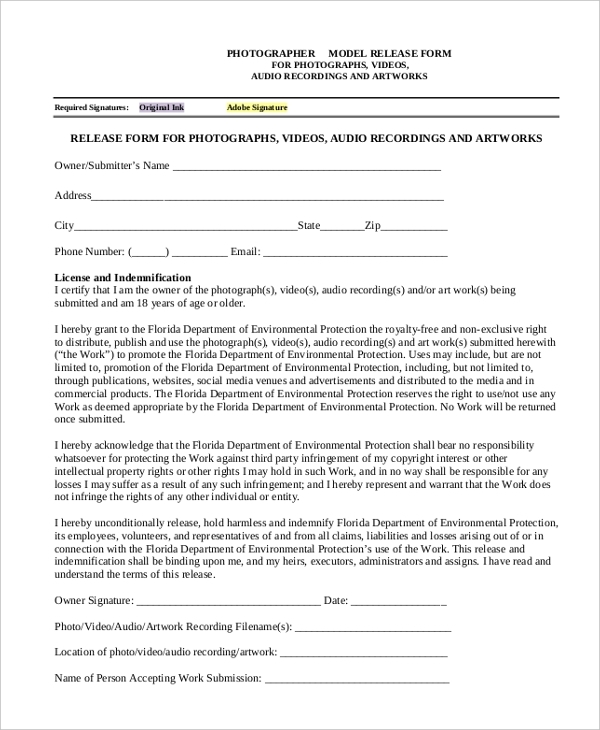 You have a neat and professional model release form here that comes with checkboxes on a list of rights you are willing to extend to the photographer regarding the publishing of your photograph. If you need consent to use the picture of a child model, this form would be handy with its pre-designed agreement from the parent. It also allows you to note down detailed information on the child model. This model release form opens up with a description of the background of the film where the picture would be used. It is followed by a declaration by the model regarding his or her free consent to use the image. 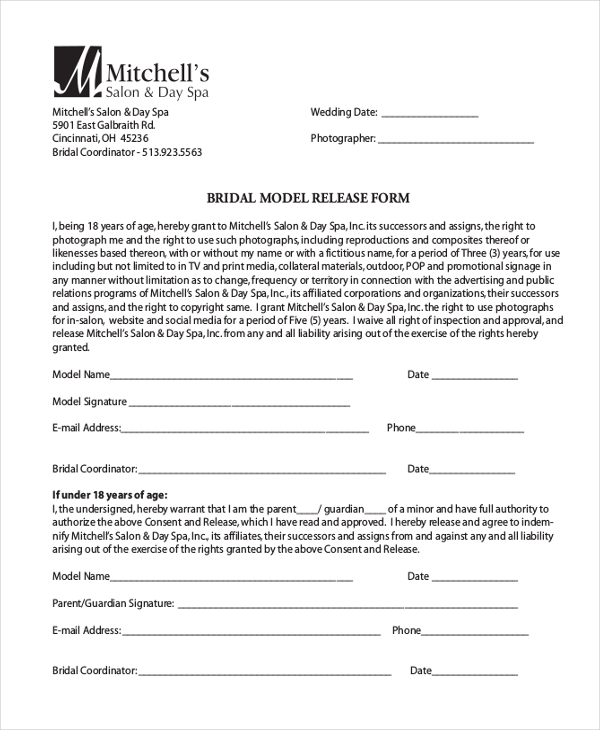 If your salon needs to use the picture of a bride model for the promotion of your services, this model release form is just the thing that you would need to attain the permission. This form would also work if the model is a minor. This is a detailed model release agreement which will be handy when you are looking to attain consent for 2 paragraphs. For minor models, there is a section to be filled by the parent. When Do You Need Model Release Form? 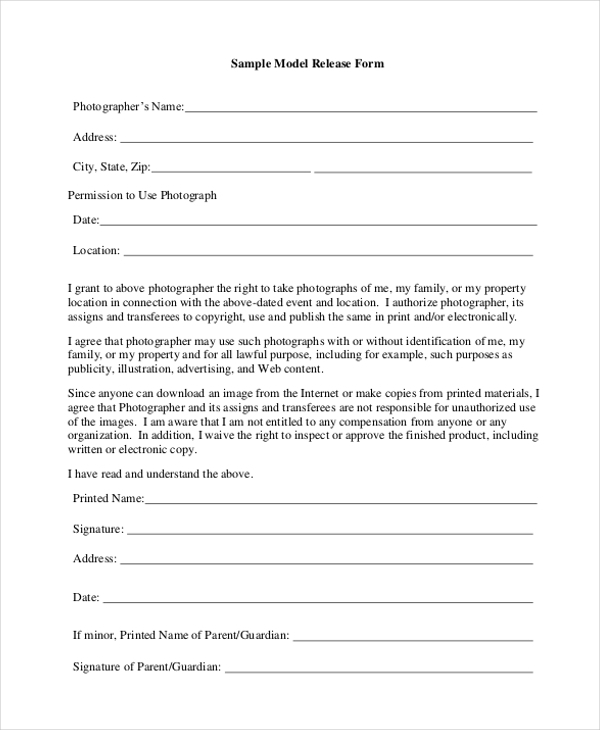 A photographer would need a model release form when he is about to publish or use the photograph of his model commercially and require consent for that from the model. The term “commercial” usage here means when a photo is to be published in brochures, advertisements, greeting cards, websites, newsletters, catalogs etc. In simple words, if the photo you are about to publish would be used to generate revenue, you will need the permission from the model to publish the image through model release form. This goes for both adult and minor models- in the case of the latter, the form is to be filled and signed by any of the parents of the child model. You may also see Media Release Forms. What Constitutes a Model Release Form? A model release form usually starts with a declaration from the model that she/he is offering consent to publish her or his photograph. The form clearly specifies that the model is willingly permitting the photographer to deploy the photograph for commercial use and defines the ways in which the images can and cannot be published. 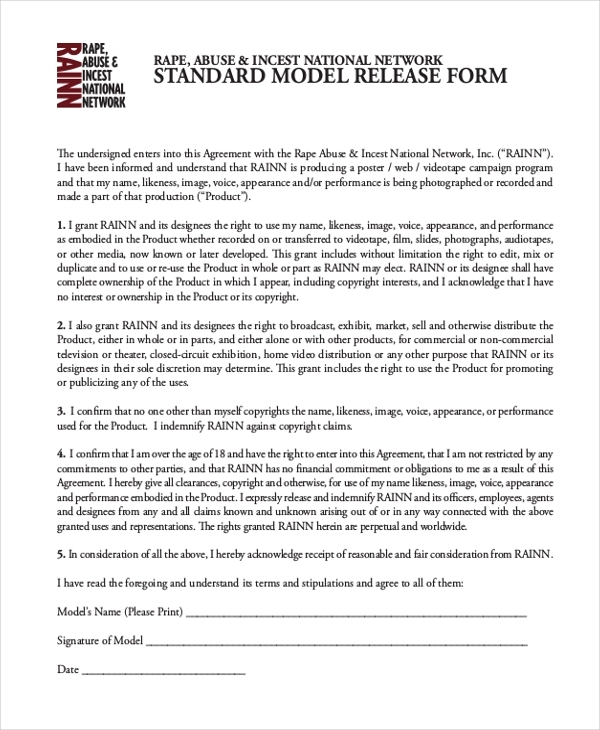 More specific model release forms cite the very media formats in which the image would be used so that there is no confusion and misunderstanding between the model and the photographer. Besides, if the model wishes to inspect the photograph prior to publication, the release form would note down that as well. You can also see HIPAA Release Forms. If you are for guidance on how to draft picture release forms, the templates mentioned above would be really handy for you. All of them come with pre-designed model release forms which you simply have to download and customize with your own data. There are even templates for minor model release forms here.